lt;stronggt;UNV12113lt;/stronggt;lt;BR/gt;Universal File Folderslt;BR/gt;Classic folder constructed to resist tearing. Bottom triple-scored for no-sag expansion. Undercut at tabs for increased indexing area. 11 pt. Manila stock. 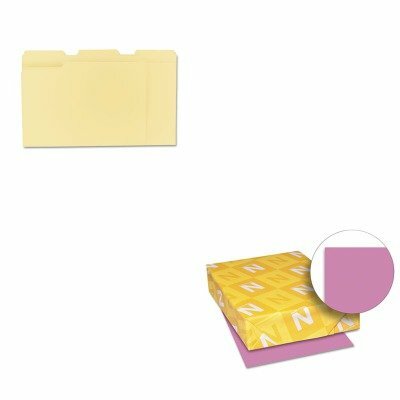 File Folder Type: Top Tab Size: Letter Folder Material: 11 pt. Manila Colors: Manila.lt;BR/gt;lt;BR/gt;lt;stronggt;WAU21946lt;/stronggt;lt;BR/gt;Neenah Paper Astrobrights Colored Paperlt;BR/gt;Impress with the brightest and the best Designer colors help you create notices, flyers, announcements and bulletins that grab people's attention. Specialized engineering ensures trouble-free performance in all laser and inkjet devices. Acid-free stock provides excellent fade resistance. This product was made from wood that came from a certified managed forest. Size: 8 1/2 x 11 Paper Colors: Outrageous Orchid Paper Weight: 24 lb Sheets Per Unit: 500. If you have any questions about this product by Neenah Paper, contact us by completing and submitting the form below. If you are looking for a specif part number, please include it with your message.